Faith Healer review (Belvoir, Sydney) | Daily Review: Film, stage and music reviews, interviews and more. 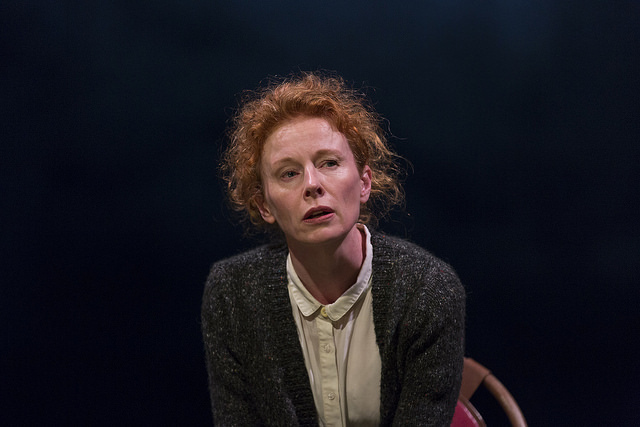 There are plenty of things to praise in Belvoir’s new production of Brian Friel’s 1979 play Faith Healer, but there’s one element that comes close to outshining all others: the acting. Between them, Colin Friels, Pip Miller and Alison Whyte deliver the most vital, nuanced and powerful performances I’ve seen in Sydney this year. 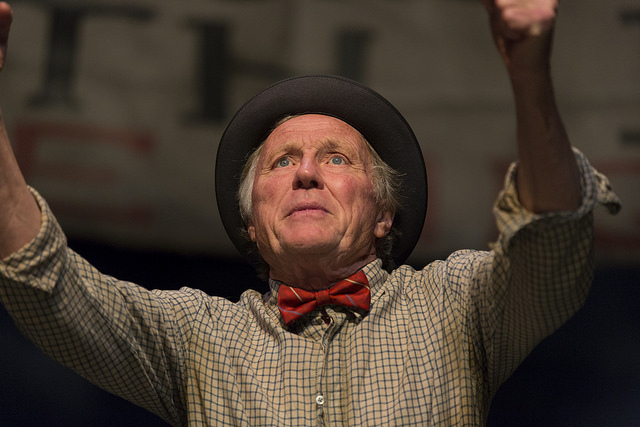 Across four monologues, the actors explore the life, obsessions and struggles of Irish faith healer, Francis Hardy. Friels opens and closes the show as Hardy, while Whyte plays his wife (although he introduces her as his ‘mistress’), Grace, and Miller plays his manager, Teddy. The exact nature of his faith healing is unknown — we know he has “healed” some people, and we know how. But we really know very little about his gift — is it the real deal, or some kind of illusion? It matters little. When we first meet Francis for his opening monologue, he’s obviously charming if a little off-balance. His storytelling jumps around a little, and is a little inconsistent, but you’re lulled into a sense that this man is fundamentally good and honest, and has things more or less together. But when the perspectives of Grace and Teddy enter the mix, Francis becomes a more complex character than the version of himself he chooses to put forth and believe in. All three characters recount some of the same events, but their recollections of them are often quite different. One character omits something another latches onto and highlights, as their perspectives seem to shape and reshape their memories. Francis then returns to close the show with a final monologue which goes as far as he can to set the record straight and tell his own truth. Friel’s (Brian Friel, the playwright, not Colin Friels, the actor) play really is a beautiful piece of writing — it’s full of the emotional details of life that flesh out a character, and gently explores notions of identity and how we perceive the world at large. Friels has the early challenge of getting the audience settled into what we know will be nearly two hours of monologue with no intermission. At first, it’s difficult to focus on the narrative as it unfolds, but it’s easy to relish his finely wrought physical and vocal take on this faith healer battling with the faith he must have in himself. Both Whyte and Miller manage to raise the emotional stakes even higher with their monologues. Whyte delivers a performance that’s astonishingly detailed, down to the smallest mannerisms and vocal lilt. It’s a performance that’s throbbing with meaning and pain, and it’s a shame she flubbed a few lines on opening night. But then we’re pulled back into darker territory as it’s gently revealed just how much personal investment he has in his client and his client’s wife. Director Judy Davis, one of Australia’s great actors herself, has clearly given these performers all they need to soar. The production elements have been drawn together seamlessly to create that sense of foreboding and just a hint of an unknowable power greater than our own. Brian Thomson’s set, made up of a raised platform and an all-encompassing stormy sky backdrop, is the perfect platform for these actors to play upon. Verity Hampson’s lighting design brings that backdrop to life, but the changes in lighting state are a little too frequent and fast. But Paul Charlier’s sound design always manages to creep in just at the right moment and shake you up. Davis’s best work is in ensuring that all three actors seem to exist so strongly in the same world. No actor shares stage time with any other actor, but you entirely accept the relationships between them. These are masters at work, and clearly working together. Faith Healer is at the Upstairs Theatre, Belvoir until November 27. Accents were good and did not detract from what I believe were three fine performances. I disagree and thought the Irish accents were great depiction of Northern Ireland. Fantastic acting! I saw the first preview on 29.10. The script is indeed impressive and the monologues well delivered but I thought Pip Miller’s was the better on the night; a lovely blend of light and shade, good humour and serious questioning of the faith healer’s credibility. Although I wasn’t really sure of what to make of the opening of all the beer bottles and then returning them with a mouthful drunk or in the latter cases not all. I don’t think the sound was particularly useful frankly, much like a great deal of sound we seem to get in ‘modern’ productions (often overly loud and discordant). It didn’t really reinforce what was being delivered. From what I saw that night I’d give it 3 and a half stars. I was at the Belvoir last evening, Wednesday, to watch Faith Healer, all in all a very well done play but the Irish accents were deplorable, it would of worked much better just spoken in their own voices with the imagination allowed to create the lilt. shakespeare’s found no need for strange accents in his non english titles. but in saying this a play well worth the time.